It’s been fun comparing flavors of fresh slices of tomatoes. Brandywine and Belgian Giant, for instance, are both scrumptious, with Belgian Giant being a little more tomato-y. Cherokee Purple is also delicious, this one with a rich, slightly smokey flavor. In addition to my usual favorites, one new variety (for me), Kellog’s Breakfast, will become a regular in my garden. 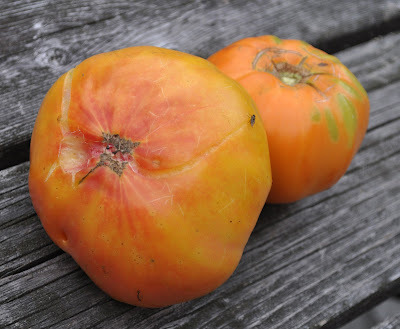 This heirloom has an odd name and a flesh that is at the same time meaty and juicy. The skin of these large fruits have a beautiful orange color with occasional deep red blushes. Not all heirloom tomatoes are delicious. The main thing the heirloom Stupice (pronounced stoo-PEECH-ka) has going for it is earliness. The fruits are small and ripen in clusters. We’ve been eating these fruits for weeks. Of course, since the later, better-tasting varieties have been ripening, we’ve been ignoring Stupice, for fresh-eating, at least. It’s better than any other supermarket tomato but not as good as Belgian Giant, Cherokee Purple, Rose de Berne, Kellog’s Breakfast, Sungold, and the other topnotch varieties I grow. 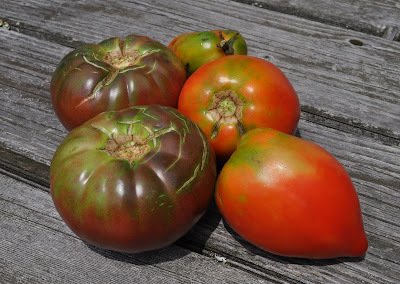 One heirloom tomato garnering special attention this year is Blue Beech, a variety that reached Fedco (www.fedcoseeds.com) from someone in Vermont who got it from her neighbor’s niece’s uncle(??) who brought it to Vermont from Italy during World War II. I tasted sauce made from Blue Beech at the farm of that original “someone in Vermont” and right then and there decided to grow it for its unique flavor and orangish color. I’ve grown Blue Beech for a few years now and this year finally decided to jar it up separately from my other varieties. (All my other tomatoes get thrown into one big pot for collective canning.) My Blue Beech sauce does not have that orangish color, but does have a distinctive, very rich flavor. Blue Beech is elongated, so looks like a canning tomato. Besides being good for canning, this tomato also has excellent fresh flavor, something that’s true for a number of canning tomatoes. Other varieties that have excellent flavor either fresh or cooked are Amish Paste and Anna Russian. A number of canning tomatoes are good only that way -- canned. Most notable is San Marzano because it tastes so good after being cooked, and taste so awful fresh. And then there are tomatoes with poor flavor “no matter how you slice them” -- fresh or canned. Roma is a often used as a generic name for any canning tomato but is also the name for a specific and, unfortunately, widely grown variety of canning tomato. The variety with this name is bland cooked or fresh. Yes, all things tomato does include some tomato diseases, just as it does every year. Gardeners and farmers seem hypersensitive to tomato diseases ever since the late blight outbreak here in the Northeast a few years ago. 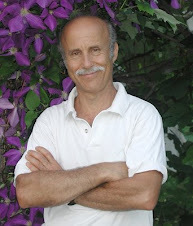 It made everyone start looking more closely at their plants, a good thing, with even organic growers ready to spray at the first symptom of any disease problem, not a good thing. I’m not planning to spray my tomatoes for late blight or any other problem. 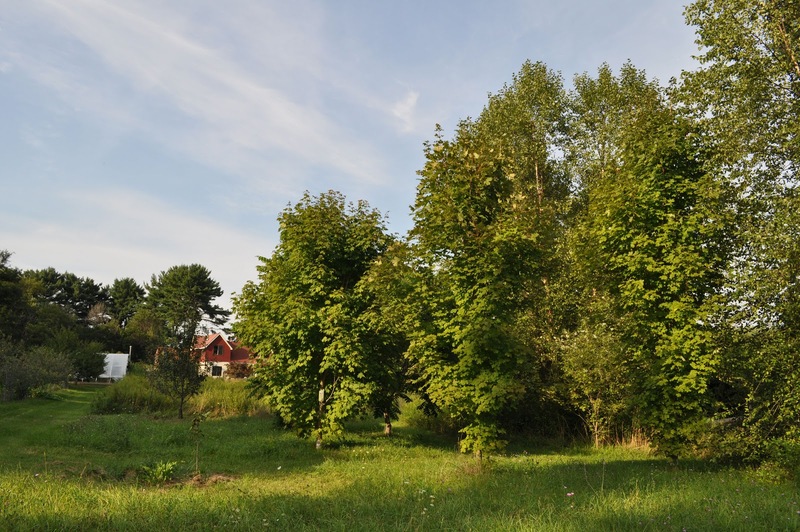 Late blight, although dutifully reported present at various locales by the Cooperative Extension Service, needs cool temperatures, humid or rainy conditions, and wind to loft it from one site to the next in order to develop and spread. We had those conditions a few years ago, in addition to multiple sources of infection from tomatoes distributed from transplants sold at “big box” stores. We don’t have that weather or the sources of infection this year (at least not as of this writing). Late blight notwithstanding, my tomatoes, trained to single stems, are pretty much defoliated for their first foot or two. The culprits are early blight, characterized by tan blotches with concentric, darker rings, and septoria leaf spot, characterized by small, round spots with tan centers. 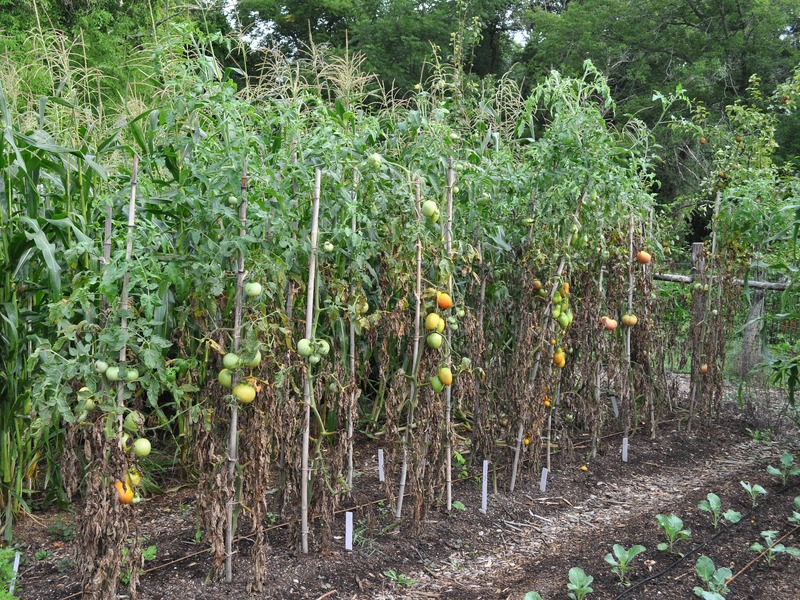 Both diseases overwinter on infected tomato debris and wild host plants such as jimson weed. My approach to keep early blight and septoria, which rear their ugly heads here every year, in check are to clean up all tomato debris at the end of the season, to plant tomatoes each year where they have not grown for the previous 2 years, and to mulch to keep spores from splattering up to the plants. And one more thing: not to worry. Every year, my tomatoes lose some leaves to these two diseases, and every year I harvest plenty of pesticide-free, juicy tomatoes bursting with flavor. 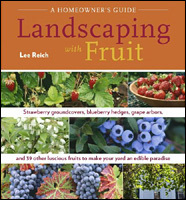 I will be giving a workshop “Grow Fruit Naturally” at Hawthorne Valley Farm in Ghent, NY on September 9th. For more information: http://hawthornevalleyfarm.org/event/grow-fruit-naturally-workshop. Not that deferred gratification is all that bad. 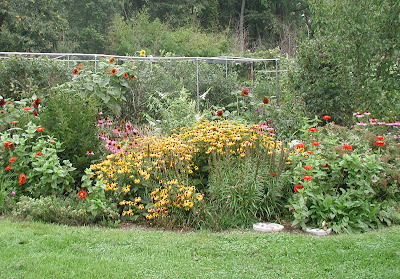 After all, except for when I began my first garden many decades ago (Madison, Wisconsin on August 1st, and I did reap some beans and tomatoes), all the while that I’m planning for the future I am reaping other rewards of past efforts. This week for instance, I’ve harvested onions, seeds of which I sprinkled into furrows in a seed flat in a cool greenhouse back in February. I’m also enjoying tomatoes of all stripes, the result of seeds planted in early April. And I see a reasonable crop of Magness, the best-tasting of all my pears, getting ready with their final stages of ripening for harvest in a few weeks. Now that I think of it, though, I do enjoy sowing seeds, planting trees, and other gardening activities that are ostensibly for some future reward. Not to mention the pleasure of watching and coaxing along plants as they develop, everything from a radish seedling, sown last week, to a maple seedling, planted 15 years ago and now about 20 feet high. I’m reminded of a name I saw on a sign hanging over the entrance to a primitive cabin in the woods of Maine: Quitchyerbitchin. It was not a native American name. There’s a flurry of deferred gratification in process: planting vegetables for the autumn garden. It’s like a whole new garden, one that begins around mid-September and continues, even here in hardiness Zone 5, into December. 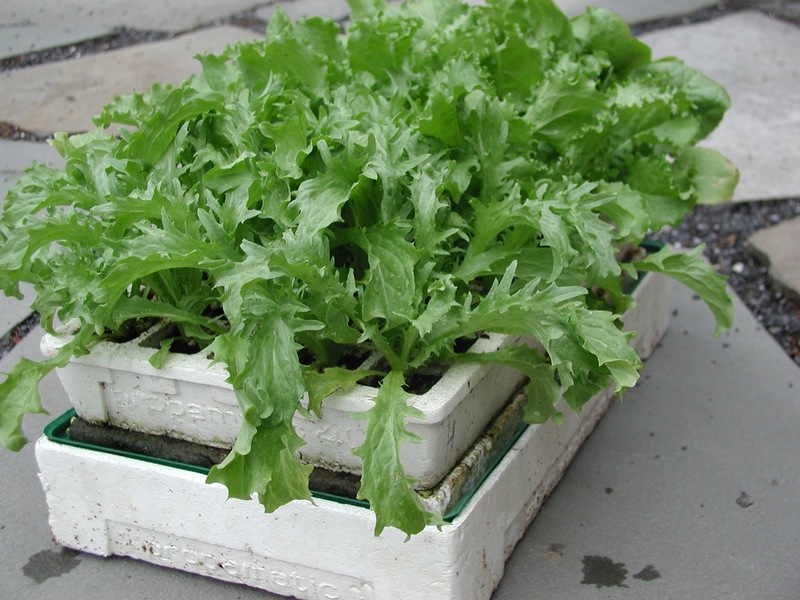 In between each of the above-mentioned endive seedlings went lettuce plants. 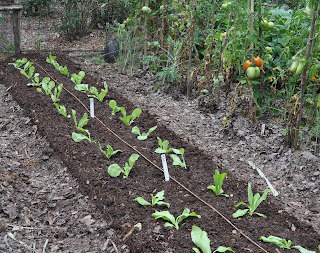 Like the endive, the lettuce was sown in a seed flat about a month ago so, like the endive, required no garden space until it became available. That space was donated by my first planting of Golden Bantam sweet corn, sown out in the garden the first week of May and now either eaten or steamed, sliced from cobs, cooled, and packed away in the freezer. The lettuce will be harvested and out of the way by the time the heads of endive start to spread and fill the bed solid with greenery. How about another bed, this one just cleared of onions? Into that bed I just planted a row of turnips and a row of Black Spanish winter radishes. You might snicker at my heaping praise upon the lowly turnip, but if you’ve ever had them sown in late summer, grown quickly, and picked during the cool days of autumn, you’re in for a real treat, roasted, stewed, or sliced raw. Hakurei is one of the best for flavor; I also like the old Purple Top White Globe. Conditions that bring out the best in turnips also do so for winter radishes, the pumped up counterparts of small spring radishes that offer the same spicy flavor but also can be stored through winter. You have to be careful not to plant winter radishes too early or they grow frighteningly large. One summer I did just that with a long, white variety of daikon radish. Very long, it turns out, given enough time. The radishes grew to look like baseball bats, their upper portions rising up out of the soil as if there was not enough room underground to house them. The experience sort of killed my taste for winter radishes for a while. Just this morning, another batch of seeds -- Chinese cabbage and cilantro -- went into seed flats. Like winter radishes, Chinese cabbage should not be sown too early in summer, in this case because long days and hot weather cause the plants to make flower stalks instead of fleshy leaves. Tatsoi and Fun Jen, the two varieties I planted, each need about 45 days from seed to maturity, but no reason to rush harvest during the cool, short days of autumn. The plants just sit there waiting to be eaten. 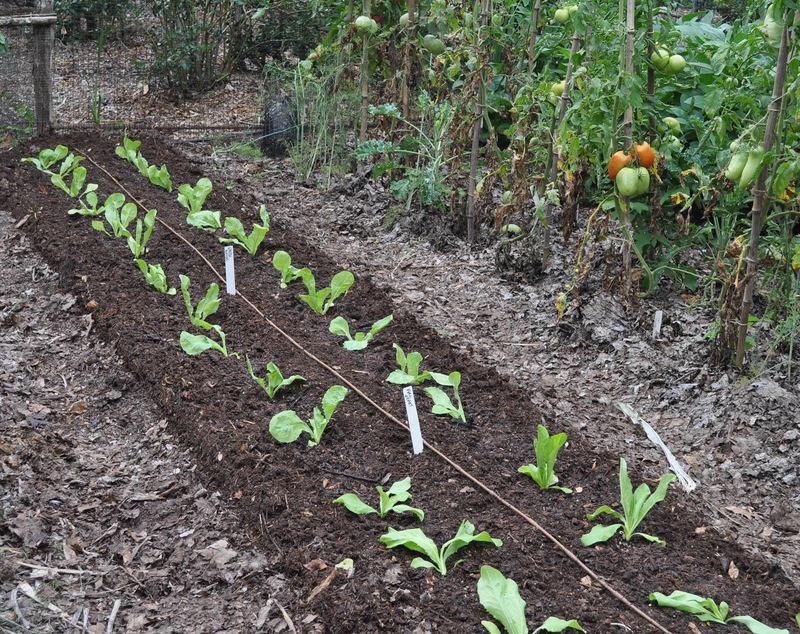 Besides suitable soil fertility, the main requirement of all these autumn vegetables is water. Fast, succulent growth brings out the best in them. With drip irrigation, I don’t have to worry about watering established plants. But until their roots can forage out into wetting front a few inches below the surface, new transplants and seeds need regular watering from a watering can or hose. You or I might be tempted to also quench our own thirst with water from that hose. In general, don’t! Consumer Reports magazine recently reported that some hoses can leach lead (used to stabilize polyvinyl chloride in hoses) into the water at 10 to 100 times the level allowable by the EPA for drinking water. The workaround is, if you’re buying a new hose, to buy one specifically labelled safe for drinking water, to let the water run before taking a drink, or -- best idea -- walk to your kitchen to slake your thirst. If your fingers aren’t stained after you’ve picked blackberries, you’re not eating them at their very best. And this is the year -- my year, at least -- for blackberries. Spring weather threw a curve ball that pretty much wiped out my developing apples, hardy kiwifruits, and pears, but blackberries are among a number of other fruits that waited patiently in spring, and whose branches are now bowed to the ground under a heavy load of fruit. An especially heavy load due to a mild winter? abundant rain (to say the least, from hurricane Irene and tropical storm Lee) late last summer? my green thumb? Who knows? In the wild, blackberries are found growing almost everywhere. Some of these wild plants creep along the ground, while others grow upright like small trees. 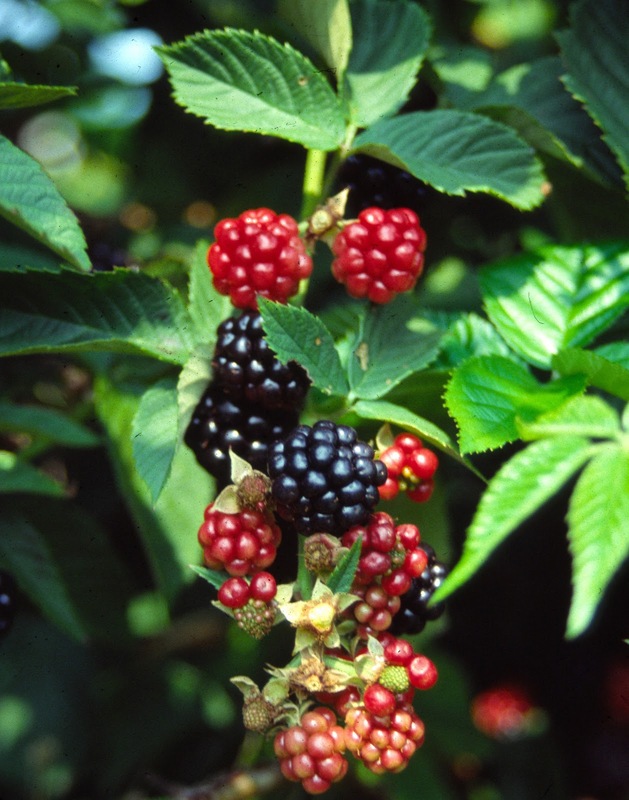 These growth habits have been bred into cultivated blackberries, so you can choose from erect varieties, which are the most cold-hardy and heat tolerant, as well as semi-trailing and trailing varieties. Trailing varieties, with lanky, flexible canes, are sometimes called "dewberries." Western trailing blackberries yield large, wine-colored to black fruits having distinctive flavors. Varieties also have even been selected or developed that lack those ominous thorns. Blackberrys' biennial canes and their aggressive spread make a case for annual pruning. On all but the trailing or trellised semi-erect types, prune twice each year. The first pruning takes place during summer; the tip of each new cane needs to be nipped off just as it reaches a height of 3 ft. Pinching causes branching and helps keep plants upright. The thornlessness of thornless blackberries is, in my opinion, beauty in of itself. It's not just that these plants are non-intimidating; the smooth, greenish stems and lush green leaves really are quite ornamental, and made more so as a background for spring’s large white blossoms. Actually, the explanation is not why tomatoes plucked from my vines taste so good but, rather, why the perfect, red orbs -- called “tomatoes” -- dumped onto supermarket shelves don’t taste so good. For this study, agricultural scientist Harry Klee, at the University of Florida, gathered together a whole lot of heirloom and modern tomato varieties and enlisted a whole lot of people to taste and rate them. Followup chemical and statistical analysis pointed the finger at the balance of sugars and acids as one important component of flavor. Modern tomatoes bear so heavily that there’s less sugars to go around, so flavor suffers. For a similar reason, I avoid growing “determinate” tomatoes (listed on the seed packet or in the variety description), which are varieties that make flowers and fruits at the ends of, rather than along, their stems. 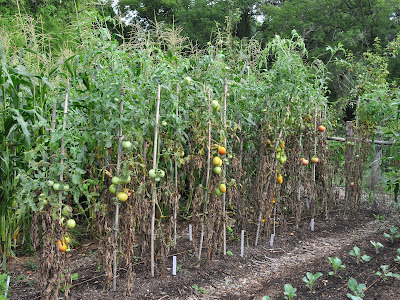 The determinate growth habit results in fewer leaves per fruit; leaves, along with sunlight, are what puts sweetness and other aromas into tomato fruits. Dr. Klee also found that, besides sugars and acids, heirloom tomato varieties have certain flavor components lacking in modern tomatoes, some of which enhance any sweetness. Geranial, which has a lemony aroma and is used in perfumery, is just one such component; it’s also present in a wild basil (Ocimum gratissimum), orange, lemongrass, and, of course, lemon. The other bit of pertinent tomato research has to do with color. Nice, on those commercial tomatoes, eh? If you eat with your eyes, the color will make your mouth water. If you eat with your mouth, probably not. In recent decades, tomatoes have been bred to color up uniformly to a nice, red color. Recent research shows that the gene that makes for that uniform coloring was a mutation of a gene that helped make tomatoes flavorful. Before ripening, the uniform ripening tomatoes are pale green rather than the deep green of tomatoes without the mutated gene. Dark green fruits harvest more of the sun’s energy than light green fruits; more green means more photosynthesis and more sugars and other flavor components. That ripening mutation, stumbled upon by breeders about 70 years ago, was widely adopted and has resulted in those beautiful orbs that have lined supermarket shelves and have even been often offered at some farmers’ markets for many years. So beauty is not only skin deep in tomatoes. 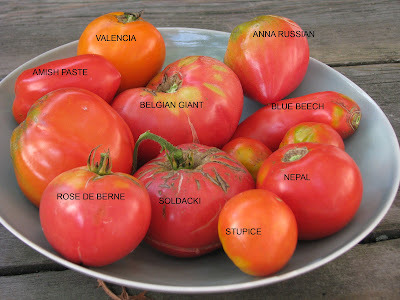 The best heirloom varieties also seem to share some superficial characteristics. Potato-leafed (with smooth leaf edges) tomatoes, such as Brandywine and Prudens Purple, generally make tasty fruits. So-called oxheart varieties (pinkish skins and heart-shaped fruits), such as Oxheart, Orange Russian, and Hungarian Heart, also are rich and flavorful. The same can be said for dark varieties, such as Black Krim, Black Crimson, and Black Prince. Hybrid tomatoes don’t have to be less flavorful than heirloom varieties. They don’t have to be bred for maximum production at the expense of flavor and/or to ripen uniformly red. But they usually are. The familiar Sungold and the less familiar Carmello are two flavorful hybrid varieties in my garden. In my opinion, Sungold is far and away the best tasting cherry tomato (and also a beautiful persimmon orange color). Carmello is quite tasty and actually does ripen into perfectly red orbs. Nonetheless, for unabashed flavor whether sliced with onions and olives in salad, laid in slivers on dark bread with cheese, or cooked into a sauce, heirloom tomatoes are my number one choice. Which brings me to Cherokee Purple, the first one of which ripened today. It was very tasty and not at all pretty. Right now I have seedlings of endive, lettuce, kale, cauliflower, and cabbage growing in seed flats. The seedlings call the flats “home” for a month or more before they’re transplanted into beds now housing early corn, early bush beans, and other vegetables soon to be cleared away. Timing for these plants is critical if they’re going to be ready for harvest during the cool days from late September on into November. Cabbage and cauliflower were sown in early June, endive in early July, and lettuce, for a continued harvest through summer and fall, every two weeks or so all summer. I’ve also sowed seeds with next year in mind. Flower seeds, in this case. 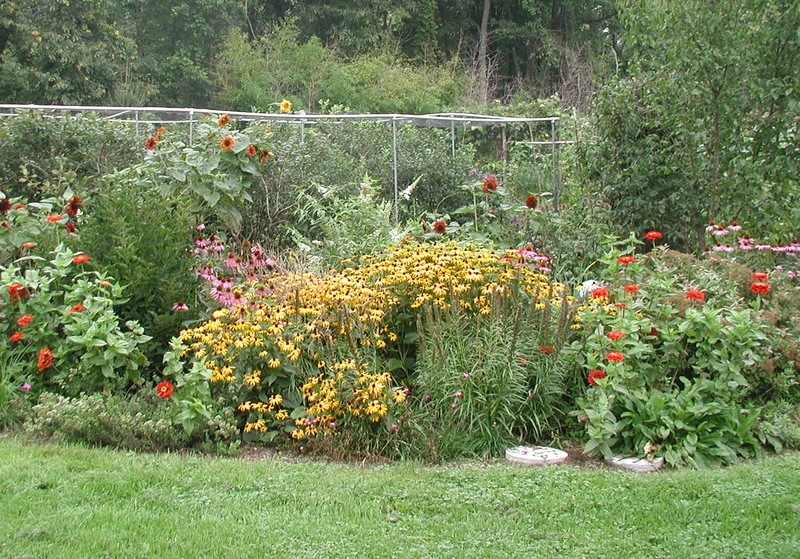 Perennial flowers usually don’t flower their first year from seed. Ones that I sow this summer should make enough growth to put on a good show next year. The flower bed undergoing renovation is crying out for black-eyed Susan plants (Rudbeckia hirta ‘Indian Summer), oodles of them. I could buy the plants but almost as easy and a lot cheaper and more satisfying is to buy a packet of seeds. One packet is going to provide many times the number of plants I need. Another bed needs more oriental poppies. Again, a packet of seeds is the more satisfying and economical way to go. I have visions of blue spires of delphiniums rising up in the space between black currant plants and the fence to my south vegetable garden. A packet of ‘Pacific Giant’ delphinium seeds fills the bill, although these seeds are more difficult to germinate and the plants more difficult to grow than the poppies and black-eyed Susans. Delphinium seeds germinate best if fresh and some sources suggest chilling them awhile before or right after sowing. My plan is to plant them in a seed flat and set the covered flat on a bench that sits along the north side of my house -- along with all the other seeds I am germinating. Another secret to germinating most seeds is patience. 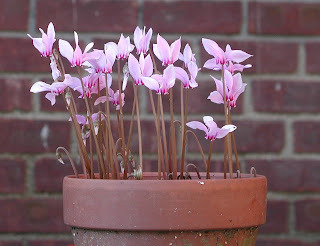 Patience surely has been the secret to my success with cyclamen seeds. 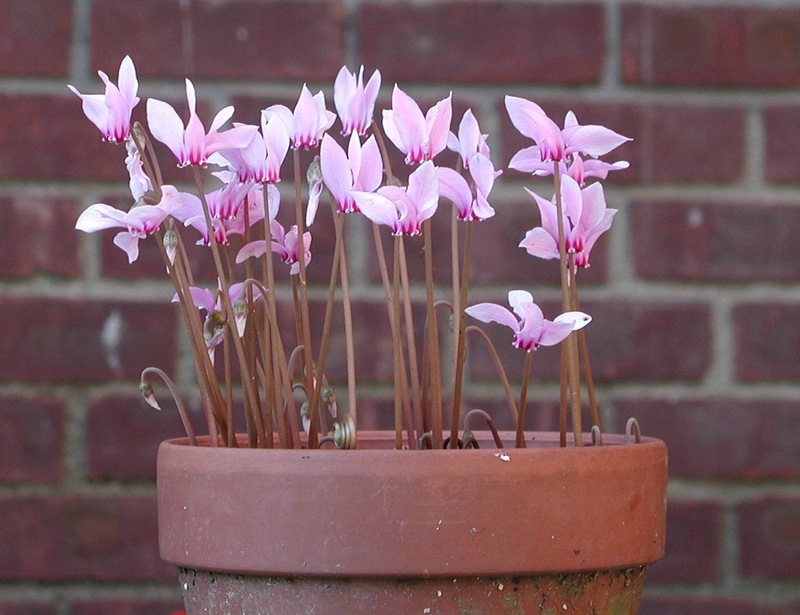 Many years ago I purchased seeds of hardy cyclamens. Besides hardiness, these plants offer dainty blossoms that hover above the ground like small, pink butterflies. And when the plants aren’t in bloom, the speckled leaves earn the plants’ keep. With the original batch of seeds came exacting instructions of temperature and time requirements for germination. I ended up with two seedlings from the whole packet of seeds, but those two seedlings have given rise to many more plants. A couple of weeks ago, the seed capsules, which are attached to a squiggly stalk, flared open to offer their ripe seeds, which I collected and sowed. The flat of cyclamen seeds now sit on that same bench on the north side of my house. My only jobs now are to make sure the flat never dries out, which is unlikely, given the pane of glass that covers it, and to have patience. The most challenging seed of those I planned to sow this summer was chamomile, not because it’s at all hard to grow but because it’s hard to figure out just what is “chamomile.” Mostly, what people grow for tea is annual chamomile, but there’s also a perennial chamomile that’s been used medicinally. But just what is “annual” or “perennial” chamomile? Usually, we garden nuts can fall back on botanical names to help out with such confusions. The fallback is not so easy with chamomile. Chamaemelum would seem an appropriate genus for chamomile and, in fact, C. nobile is a botanical name for perennial chamomile, which has also gone under the monikers of garden chamomile, Russian chamomile, and Roman chamomile. Not to confuse things, but this plant has also paraded under the botanical name Anthemis nobilis. Anthemis plants generally are referred to as dog fennels and, of course, chamomiles. Not to further confuse things, but I must mention A. tinctoria, golden marguerite, a wonderful ornamental in this genus, especially nice trained as a small tree with a head of white, daisy flowers. Getting back to my tea, with annual chamomile . . . that’s Matricaria recutita, which, oddly, has the common name “sweet false chamomile.” It’s also gone under the botanical name of Tripleurospermum maritimum subsp. inordorum. And not to be confused with Matricaria matricarioides, pineapple weed, which grows all over the place and differs from any of the other chamomiles in that the flowers lack prominent, white petals. It has a pineapple-y aroma. Bottom line: For my tea, I need annual chamomile, Matricaria recutita. Because it’s an annual, I’m going to wait until next year to sow it.